Several years ago, in an effort to liven up her weekly staff meetings held each Monday morning, Lt. Governor Skillman requested that several of her fellow elected officials and also state agency leaders join as a "guest" for the day in hopes that both the guest and the staff would leave the meeting with an improved understanding of the other's operation. Throughout the course of those dozen or so weeks, countless leaders shared a plethora of valuable lessons and experiences in government service. Of all the guests who entered Room 333 of the Indiana Statehouse during that speaking series, it might come as no surprise that the most memorable of all was Governor Mitch Daniels. This of course was before all of the speculation involving him in a 2012 Presidential race, a much more intimate discussion regarding his work as a staff member to both Senator Lugar and President Reagan. Speaking in regards to Reagan's hesitation to become dependent upon or deeply involved with a set group of people, Governor Daniels attributed this character trait to Reagan's time in Hollywood. Traveling from set to set on a sometimes weekly basis, it was difficult to really get to know or trust someone. As anyone who travels frequently can attest, saying goodbye can be an exhausting affair and also quite time-consuming. Fortunately in today's society, as opposed to Reagan's era, there is a tool that over 750 million people use to stay in contact with one another- Facebook. The website is now available in over 70 different translations, so rest assured that language now won't even be a barrier. Even in a country such as Afghanistan, where electricity is a luxury in most villages- rest assured that the youth are connecting. With the advent of smart phones and increasing broadband services throughout the country, many of the locals have already sent their "friend requests". As I attempted to make a list of all those I wanted to visit before leaving FOB Salerno, I decided to focus on those that I might not soon see back on United States soil. The obvious group of men involved here would be our interpreters, mainly men in their mid-20's applying feverishly for "Special Immigrant Visas" to the United States. These dedicated, jovial Pashtun men we have worked with over the last year have done great things for all of humanity. Some immigration critics may argue that these are the very types of citizens that Afghanistan needs, but I'm quick to argue that these are also the very types that America needs as well- in fact, one might conclude that these are the types that actually make America the country she is today. Some of these men have actually been serving as interpreters for US and Coalition Forces for the last eight years. Each and every one of them have chilling details of past firefights, as you might well imagine. 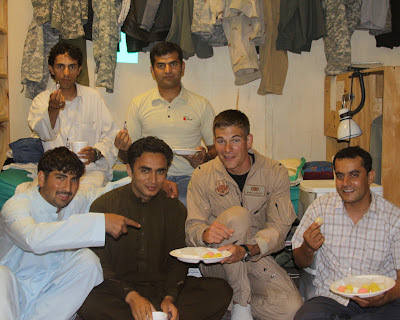 One night last week, in an effort to bid farewell to as many interpreters as possible, I attended a ghullam jani party. The party was held at one of the small huts where all of the local nationals live, near the perimeter of FOB Salerno. Ghullam jani (think donut holes but all sugar, no dough) are a traditional candy in this part of the world, taken with chai tea to commemorate special events. While these treats are a bit sweeter than my usual choice of desserts, it's the experience that counts and for that I am most grateful. At first glance you might not notice the Caucasian Hoosier in the opening photo. As always- there is a great story behind my very own custom-made set of man-jams. Isah, one of our interpreters, was kind enough to take my measurements to the local tailor in the downtown bazaar. Before giving Isah my measurements, I went to the laundromat on FOB Salerno to inquire if someone there could size me up. Within minutes of the tape coming out, a crowd had gathered to marvel at the sizes the tailor was announcing to his scribe. Isah was also very anxious to inform me that the tailor who actually made the man-jams was curious where this "large man" came from. Isah, never one to miss a beat, quickly responded that I was his "Uncle from Japan, just visiting Khowst for a few weeks this summer." My farewells would not be complete without at least a thank-you to my great Ugandan friends. All of these men are great examples of optimism. No matter how miserably warm of a day it is on FOB Salerno, you can always count on a smile and a wave from each and every Ugandan you encounter. The economic opportunities that the wars in Iraq and Afghanistan have opened up for thousands of Ugandans such as these men is a story in itself. One Ugandan man in particular has been especially inspiring. Innocent Mwakatabu, a loving husband and father of three that I've mentioned in past blogs, is one of those people you meet and within seconds of shaking hands- you know you're in good company. Throughout our time on Salerno, Innocent and I have shared countless discussions on topics ranging from the 2012 Presidential Campaign to the terrifying reign of Idi Amin. Most of these discussions took place over the dinner table, at first after mass on Saturday evenings but later on a much more frequent basis of several nights per week. One evening while having a political discussion, the topic of President George W. Bush came up and Innocent's eyes immediately lit up. 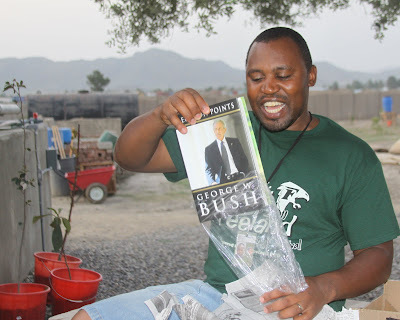 I just so happened to be reading a copy of GWB's newest book Decision Points at the time, so I offered to let him borrow it. Within two days time, the book had been returned and we now had yet another topic to discuss over the increasingly mundane meals the Salerno "chow-hall" had to offer. Several weeks later, during a conversation with a friend who works in President Bush's "retirement" office, I shared Innocent's extreme interest in American politics and devout appreciation to the Bush Administration for all of their efforts to combat AIDS in Africa (even Bono agrees on this accomplishment). Astounded by this story, she offered to send a signed copy of Decision Points. Just a few days ago, in what became my last dinner conversation with Innocent, I invited him over to the ADT Headquarters prior to dining to present him with this great surprise. As you might imagine, the look on Innocent's face as he opened the package containing the autographed book was one that words can't quite describe. Instead, I'll yield to the photograph. This book will be a perfect memento for Innocent and his entire family to commemorate the time he spent away from them while in both Iraq and Afghanistan. If all goes as planned, Innocent should be home for Christmas this year- a first since 2008. With my list of "those to say farewell to" pretty much complete, there was only one item of business left for me to tend to. This item, a work in progress, came to my attention after the world lost a great man. That man is John Harrington and many of you might recall that he was the forestry expert from New Mexico State University who was tragically killed in a bicycle accident within the last few months. Before John departed FOB Salerno, he began assisting one of our interpreters with the arduous task of applying for admission into the New Mexico State University Graduate School. With the help of Captain Randy Cuyler, the conversation continued between Rahim and John up until we received the unfortunate news of John's passing. After reading my tribute to John on this blog dated June 9th, a colleague of John's emailed me in an offer to assist wherever possible with Rahim's pending application to NMSU. This gentlemen, coincidentally named John as well (now the Afghan's think that all forestry experts in the US are named John), worked with John Harrington at the Mora Research Center in Northern New Mexico. In email correspondence we all agreed that this would be a fitting tribute to John Harrington's legacy, to finish what he had started. What better way to honor a man's work on this earth than to nurture a seed that he had planted before his departure? With an 11.5+ time difference and a sketchy phone network, the weeks we spent communicating with folks in both the Plant and Environmental Sciences Department and also the admissions office were a great test of patience. Needless to say, although I've never before been involved in immigration issues or even graduate school admission- I can now hold a scholarly conversation on the topics of I-20's, TOEFL tests, and the wonderful world of third party "credit evaluators". One of the largest hurdles that most international students face when applying for admission to universities in the United States is the necessity of proving that they have the financial wherewithall to support themselves. As any parent or student who has seen paperwork from a bursar's office in the last decade can attest, higher education is anything but affordable these days. 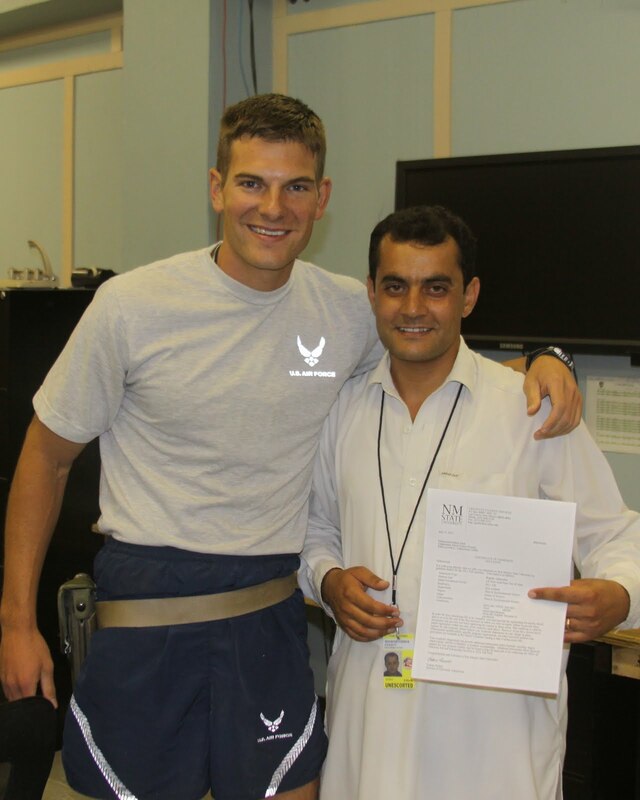 Fortunately for Rahim, over his years as an interpreter and most recently his work as the contractor who made the Future Farmers of Afghanistan project possible, he has been able to save up an amount sufficient to prove to NMSU that he is financially capable of supporting himself. I'm happy to report that late last week, in an email Rahim opened with great anxiety in the presence of a few of us who helped him through the process, he received a "conditional" acceptance into the Department of Plant and Environmental Sciences at New Mexico State University where he will work towards a Masters of Science degree. 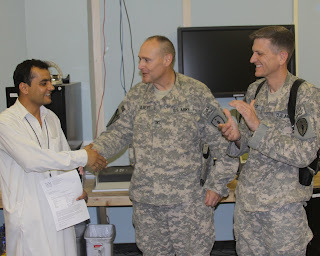 (The conditional acceptance was based on a few technicalities that he has to complete either at the Kabul Embassy or upon his arrival in New Mexico, minor details in the larger picture.) To say that Rahim was excited to read this news would be a drastic understatement. When I look back to examine how this whole string of events has unraveled-Rahim's selection as the contractor for the FFA project, John's coming to Salerno, Rahim and John's mutual interest in forestry and ultimate application to NMSU, John's tragic bicycle accident, and finally Rahim's acceptance into the Plant and Environmental Sciences Department-I can't help but marvel at how things have a way of working themselves out. In a most fitting tribute, the gracious folks back at NMSU are also looking into the possibility of funding an "assistantship" for Rahim out of salary savings that would have originally gone to John Harrington. So alas, because of the wonderful world of Facebook and other social networks- there was no need for me to really say goodbye to any of these delightful individuals. Just think of how many friends or fans President Reagan would have if he had his own personal Facebook page today? Regardless, I'm very thankful to have had the opportunity to meet so many unique individuals across the world who are fighting for a just cause.